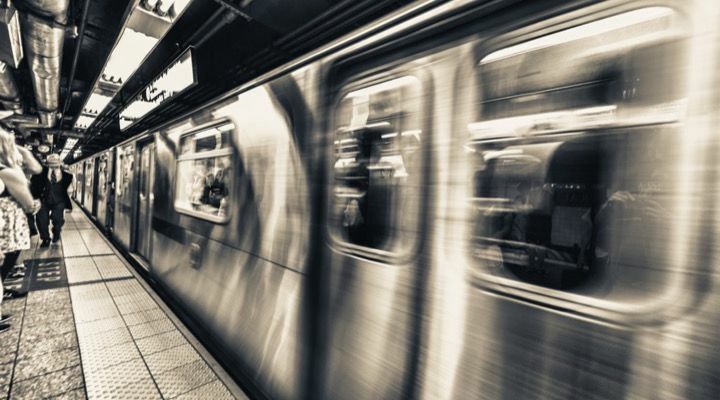 When Juan Ayala boarded the subway in Brooklyn on his way to work during rush hour he assumed it would be a commute much like every other. But when he heard an altercation involving racial slurs and threats of violence, he knew he had to intervene. Juan Ayala is a 31-year-old security guard who also puts out regular podcasts online, sharing his views and opinions on life on a regular basis. 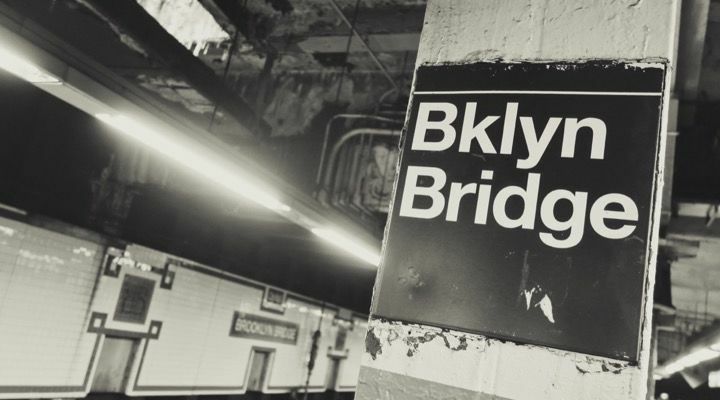 An unassuming type, Ayala found himself recording some live action deep beneath the streets of New York on his phone, but when the altercation turned nasty he was forced to step in and help. 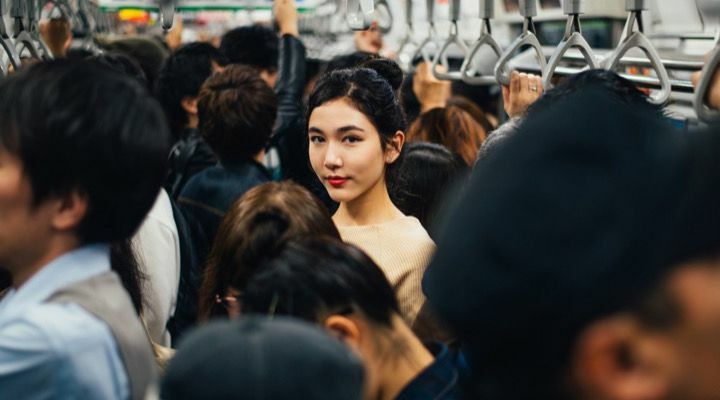 From Ayala’s point of view, Tung, the woman being attacked, appeared to be the innocent party in the fracas and was seemingly being bullied by her older attacker. “She had a bow on her head,” Ayala told the New York Daily News. “You can’t get any more innocent (looking) than that. That’s, like, a staple of innocence,” he said. 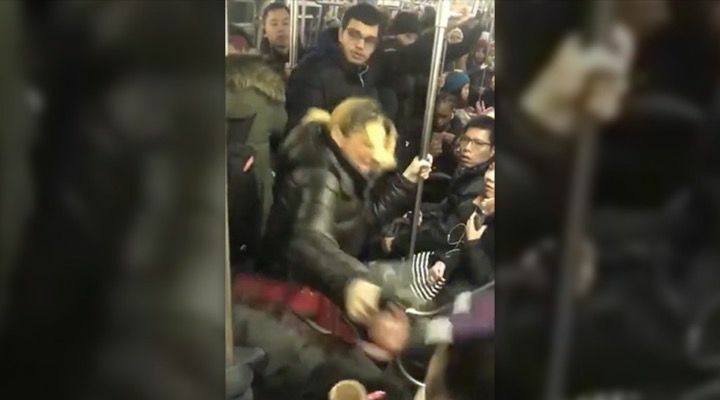 According to Tung, she said to Lushchinskaya, “Don’t touch me with your bag,” but that just infuriated her even more, and that’s when the violence started. “She hit my phone and my hands,” Tung recalled, “I’m lucky that she didn’t have any weapons on her, like knife, gun, ’cause it could’ve got a lot worse,” she said. The video begins with Lushchinskaya telling the girl next to her to “F*** off” then taking off her glasses and gloves. She appears to then proceed to take out her keys and umbrella to use in some way. Whatever is brewing, it’s certainly not good and it’s clear that Ayala and the man next to him are ready to videotape the whole thing at the very least. As Tung said to reporters after the incident, “There’s something wrong with her,” she said. “I think she should be locked up at this point, and I’m lucky that it was me and not sometime else who wouldn’t defend themselves,” she added. Tung also suffered lacerations to her face as a result of the attack. 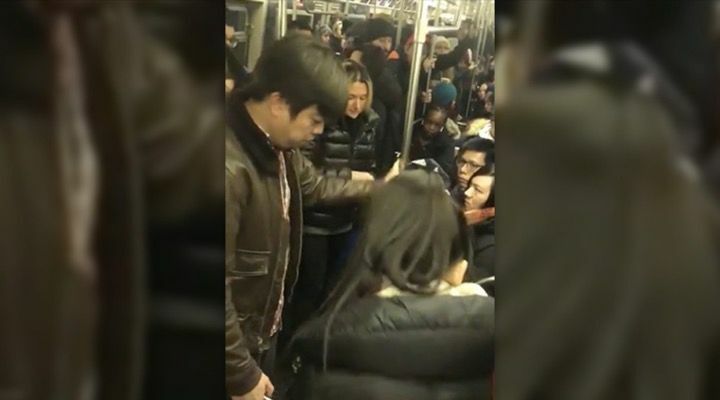 For her part, Tung said she is afraid to bump into her attacker again and fears riding the train as a result of the attack. 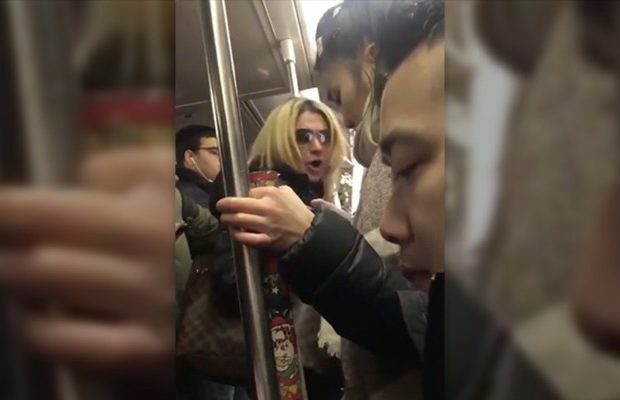 While other passengers tried to intervene in the altercation, one was called “f**king retarded” by Lushchinskaya who was wielding a small umbrella while trying to kick Tung and other commuters. 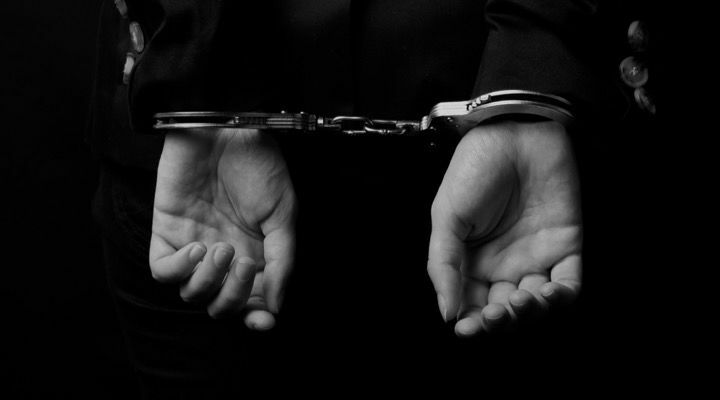 Under New York state law, a private citizen is permitted to use reasonable force to detain another person who is committing a felony in their presence. 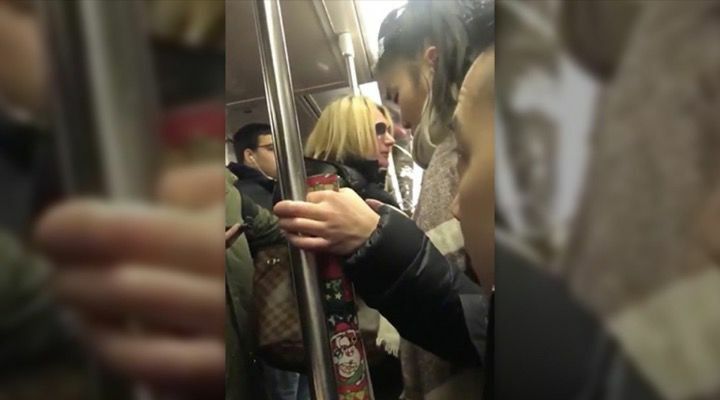 But Lushchinskaya had been in trouble just two days before on the same train line, claiming another woman had pushed her close to the train tracks. Court records also show that Lushchinskaya was arrested in June on charges of menacing, harassment, assault and criminal weapons possession. Lushchinskaya then proceeds to attack Tung, kicking her, striking her with her umbrella, and complaining that the crowd won’t allow her to hit her. Several people try to intercede, separating the two women as best they can. People around keep asking her to stop and ask her why she’s lashing out, but the woman offers little explanation, only more attacks. Tung told reporters she felt very lucky that other commuters came to try and assist her. 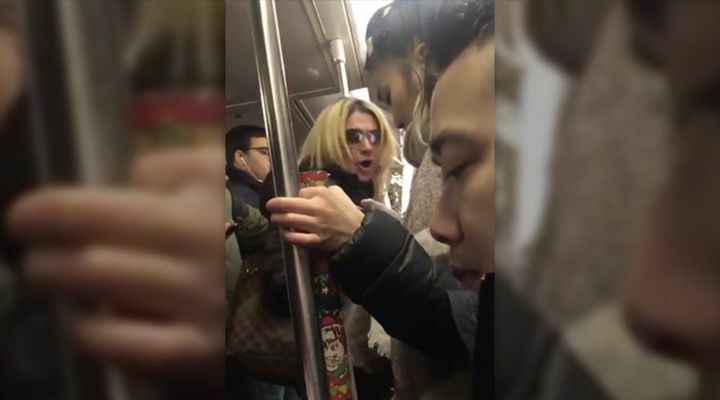 “I was lucky that people on the train were helping me, especially the first Asian guy who stood in front of me right away because he wasn’t recording,” she said. “He just stood in front of me to help me, because I know other people were recording, but their recording didn’t do anything until later on when it escalated,” she added. 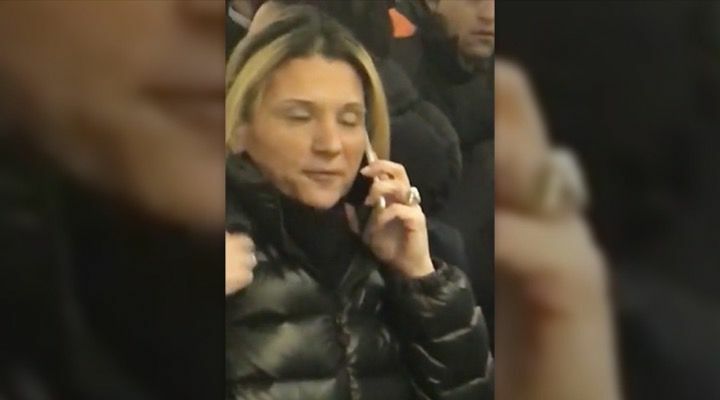 Genesis Tolentino, another passenger, told reporters that all the commuters that day ended up being late for work due to Lushchinskaya’s behavior. “It’s Tuesday morning. Everyone wants to get to work. 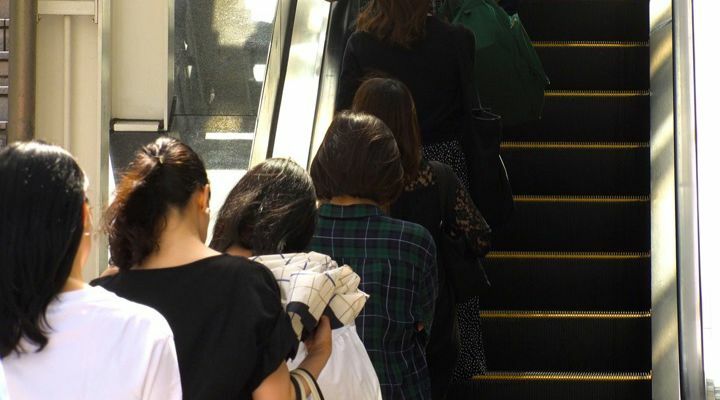 I know I wanted to get to work, and at that point [the incident] delayed everyone,” Ms Tolentino said. 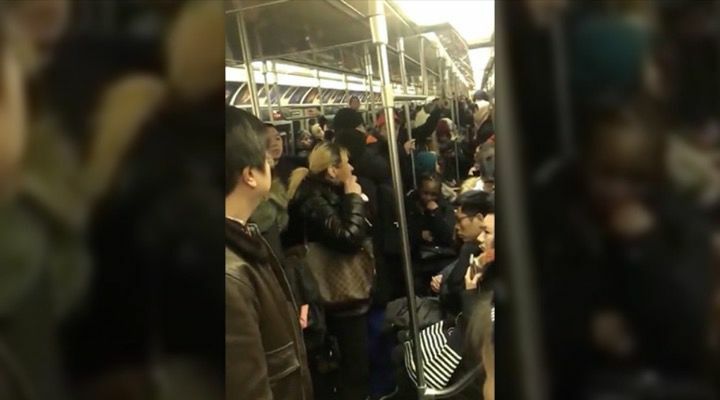 “You’re getting mad over the train being packed. Just brush it off and go about your day,” she said. 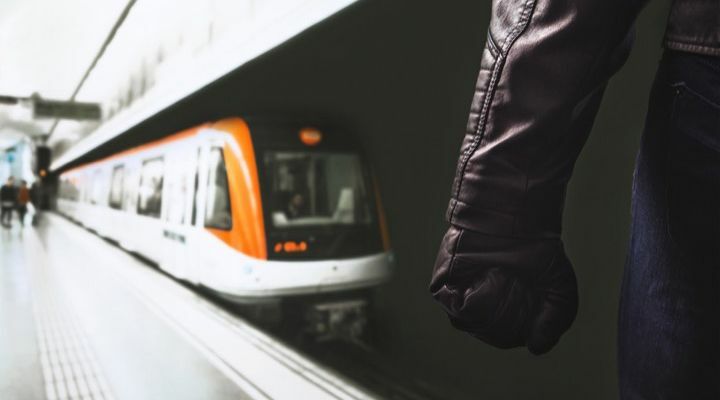 Later, after everyone left the train, the attacker took a full swing at Ayala as he attempted to arrest her. He had no choice but to grab her wrists and restrain her properly. 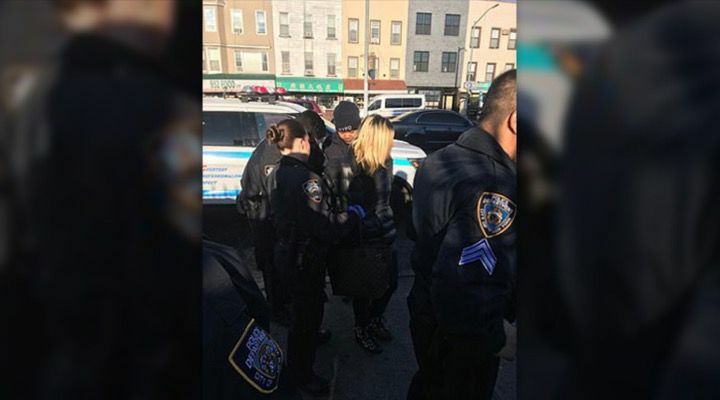 “Without those seven or eight witnesses, if those cops saw a black guy holding onto a blond girl, I probably would have been shot,” Ayala said. “I was a little freaked out. I’m not gonna lie,” he added. Getting emotional, Lushchinskaya continued to strike at Tung with her keys and umbrella, seemingly undaunted by the people attempting to stop her. 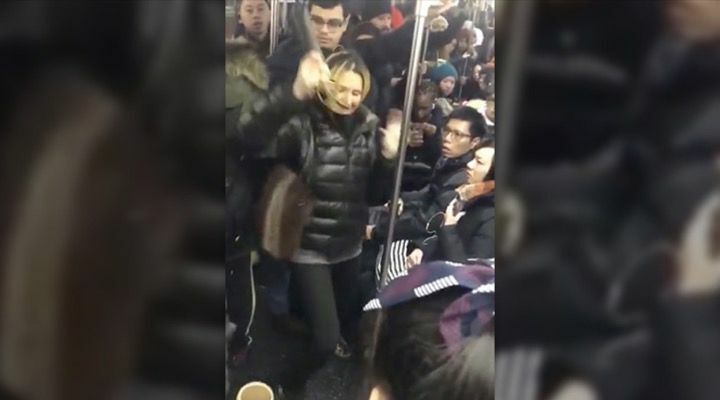 Her only response to the complaints of those around her seemed to be repeatedly telling them to “F*** off!” Thankfully, no one on that train was about to stand for such behavior, but even when her umbrella is taken, she persists. 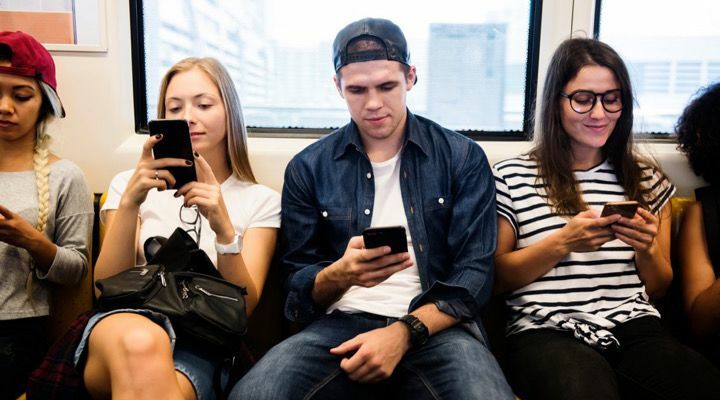 Lushchinskaya, who wasn’t having the best morning of her life, then turned to Ayala and knocked his cell phone out of his hand and onto the floor of the train. When she spat directly at him, he saw red and used all his self-control to not lash out at her. He wanted to simply wait calmly for the cops to arrive and make an arrest. 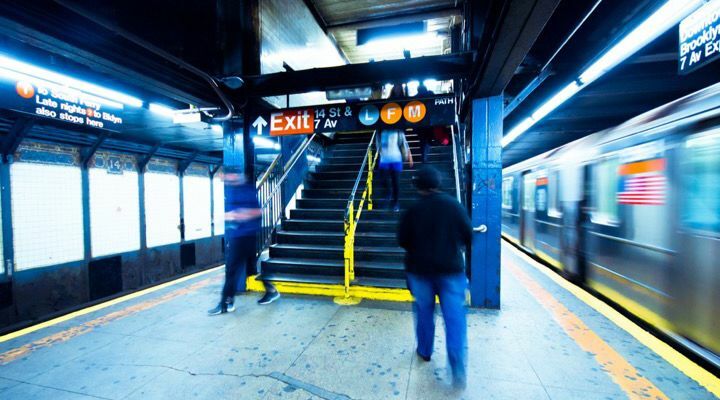 Ayala told reporters that he remained calm until the woman mistook him for a Muslim, even though he is of Dominican descent, and called him Muhammad Atta, one of the 9/11 terrorists. It was at that point that the brave security guard stepped in and spoke back to the aggressive woman. When the cops finally arrived, Lushchinskaya was arrested and charged with felony assault. 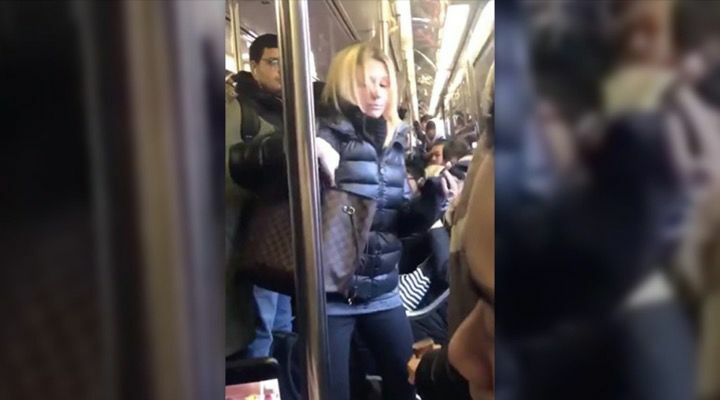 This was the second time this year she found herself in trouble due to being aggressive on a D-line train despite the fact she is an attorney with a small private practice in the Sheepshead Bay section of Brooklyn. Still angry, Lushchinskaya picks up her phone, proceeds to call somebody on her cellphone. 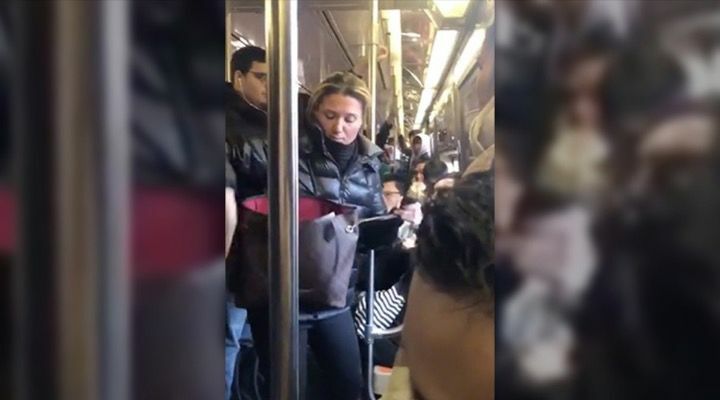 She then calls Tung a racial epithet and, realizing the subway car she seems to have found herself in, takes her keys out one more time in order to “protect herself.” The only silver lining to this story is the unity that other commuters showed in the face of racism and banded together to fight the aggressor.